If you have already benefitted from the immediate tax deduction offered by donor-advised funds (DAF). 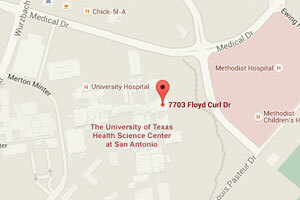 You should know the UT Health Science Center San Antonio is an IRS qualified public charity and thus is eligible to receive contributions from your DAF. Please follow the instructions provided by your fund regarding minimum contribution, the process for recommending grants etc. To use DAF Direct, use the DAF Direct form on this page. The information provided on the University of Texas Health Science Center at San Antonio (University) website is intended solely to provide you with information and education about the activities of the University. The University does not endorse or recommend any commercial products, processes, or services. Some University sites may provide links to other Internet sites only for the convenience of Internet users. The University carefully selects the websites with which it is associated. However, it is not responsible for any information or content that appears on any website outside of its direct control. The University does not endorse, warrant, or guarantee the products, services, or information described or offered at these other websites. This information and content disclaimer pertains to all websites outside of the University’s direct control, including, but not limited to, those sites that are linked to the University web site.